You know when you find a product, or a few products from one company, that with barely any effort on your part, make you look GREAT? Great, in the way that everyone who sees you asks if you’ve been on vacation, or if you’re trying something different with your hair… that way in which you look so naturally good and polished that no one can tell what’s different? 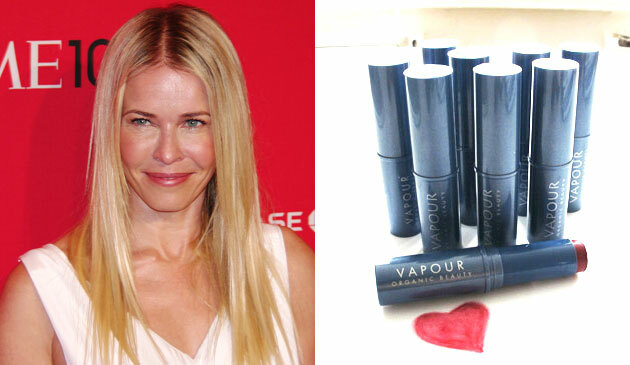 Well, Vapour Organic Beauty’s multi-use cheek and lip color has been that for me for quite some time, now. About two years ago I was lucky enough to receive some of their best selling cheek and lip stains and multi-use cheek and lip colors. I sorted through them, picked out my favorites for me and few friends – all of us with different coloring – and immediately put Courtesan 213 on my cheeks. I looked like I’d just been in an hour and a half yoga class – alive, glowing, and somehow peaceful and happy. That’s a lot to ask of a cheek color, but I kid you not – that’s how I felt, and as the days (and now, years) have passed, I continue to get that positive reinforcement from those around me when I wear it – so I know it’s true. I know that many of you are hesitant to use a cream cheek color. I know this because I get emails about it, and people will often ask me when I teach classes or am interviewed for articles: how do I apply it? Will the color stay throughout the day? Will it make me break out? All great questions, and after many years of using cream cheek colors (from NARS’ multiples to 3-custom color sheer cheek stains, to those from the natural brands that are taking the cosmetic world by storm: RMS, Kjar Weiss, Revolution Organics, Isa’s Restoratives, and of course, Vapour), I know that cheek creams across the board are my personal favorite, both for work and on my own face. I encourage you to try it on a well moisturized face (but let your moisturizer or oil sink in for a few minutes before applying your cheek color), with clean fingers, and just press the color into the apples of your cheeks – the part that perks up when you smile. Use your fingers or a brush or a sponge to tap and blend so that you can’t see the edge where the color begins to fade off your apples. I often set the cheek color with a sheer application of a corresponding powder blush if I know I (or my client) won’t have a chance to look in the mirror to refresh. That’s the only complaint that I have heard about cream cheek colors -particularly about those from the natural brands – that color tends to fade as the day wears on. My response: it’s a good thing we carry purses! Reapplying is not a bad thing! We should be looking in the mirror half way through the day to see how we’re presenting ourselves to others, no? On the lovely Chelsea I used a very sheer application of Vapour’s Aura Stain in ‘Impulse’, and I applied it with my fingers to her very well moisturized cheeks, and then I used a brush to blend the edges seamlessly. Impulse is a very intense color and if you apply it from the tube, or more densely with your fingers, you’re going to get a lot of color deposit. My friend came over the other day wearing it as a lipstick and it was amazing – and very intense! It’s all about how you apply it, which is cool because you can personalize it, and create different looks with the same product. Two treats (or more) in one! I topped off the center of each cheek with the most sheer application (this time applied with a wispy brush) of Vapour’s shimmer cheek color in Whisper. As you may know, I’m not much of a fan of anything with shimmer for real life, but in photo shoots, out at night, and on the red carpet, it can look awesome when applied sparingly, and camera flashes pick it up quite nicely. One quick story: the day I received the package from Vapour about two years ago was a long and exhausting one, but when I got home from work around 10pm, I couldn’t help but open the bag and start trying everything. By midnight I’d sampled each piece, and I found myself doing something I don’t think I’d ever done before: I looked up one of the creators on Facebook and messaged him to tell him how much I loved the products. I sent him, essentially, a love note, at 1am! After I sent it I thought: he’s going to think I’m looney. Lucky for me, he must be a night owl, because I got the nicest message in response from him – at 2:30am! Since then, I’ve had the pleasure to have spent time with the co-founder and formulator, Kristine Keheley. She’s one of those women who knows everything about ingredients, knows how to explain what she knows for the average person,and is both scientist and artist. It makes me feel so good to have respect for, and actually like the folks behind the brands I use.